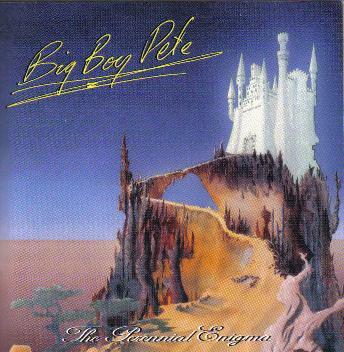 Big Boy Pete - "The Perennial Enigma"
If you haven't heard of Big Boy Pete, don't feel bad. The only way I even know about him myself was from the 1968 track of his, a 45 single, "Cold Turkey", that I happen to have on a various artists CD that I got from the U.S. Bomp label, 'Electric Sugar Cube'. This is apparently a CD reissue of his 1973 album and I actually thought it was decently impressive. Best described as well played British psychedelia. Most memorable cuts here are "Get Up And Dance", "The Farm", the awesome sounding "All Down The Road", the truly inspiring "My Place", "The Prayer" and the tripping "Guitar Center On A Saturday Afternoon". Line-up: Big Boy Pete (aka Pete Miller) - guitar & vocals, Dave Merrill - keyboards, Sean Silverman - bass, Ray Moseley - tenor sax and Rob Anderson - drums. Comes with a very nice 24-page booklet (most Angel Air releases don't come with a booklet this thick) that features plenty of liner notes, memorabilia and super-rare photos (in full color) of Pete and his band. It's been noted that Miller had at one time toured with the Beatles and the Stones back in the day. Should appeal to fans of The Troggs, The Herd, Fuzztones and The Easybeats. If you're wanting to add a little known long-lost audio gem to your music collection, look no further. Well worth hunting down a copy.